The Seattle Seahawks and the Green Bay Packers square-off on Sunday Night Football this week in a rematch of last season’s NFC title game. BetOnline has listed the Seahawks as 3.5-point road underdogs this time around with the total set at 49. All the action from fabled Lambeau Field is set to get underway at 8:30 and this huge early season NFC showdown will be broadcast nationally on NBC. The Seahawks will be looking to avoid an improbable 0-2 start this Sunday night following last week’s stunning 34-31 overtime loss in St. Louis as 3.5-point road favorites. The total in that game went OVER the closing 40.5-point line. Seattle rallied from an 11-point deficit to tie the game in regulation, but the rally fell short in the extra period of play. It would be hard to put too much blame on the offense for the opening day loss with Russell Wilson throwing for 251 yards and Marshawn Lynch leading a team rushing effort that totaled 124 yards, but Seattle’s line did give-up six sacks and Wilson was picked-off once. The real concern has to be on both defense and special teams after allowing 34 points to a team that was ranked 21st in the NFL last season in scoring. Green Bay hammered-out a key 31-23 victory over NFC North rival Chicago as a six-point road favorite. The total in this game went OVER the 49-point closing line. Two fourth quarter touchdowns helped seal what was just a one-point game at the end of three quarters of play. Aaron Rodgers only threw for 189 yards, but he looked sharp in completing 18-of-23 attempts including three for scores. 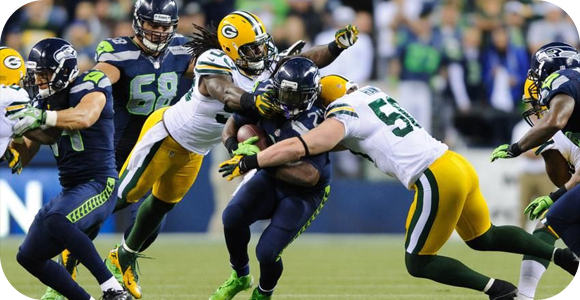 The Packers also did a good job moving the ball on the ground with 133 total rushing yards. Eddie Lacy led the way with 85 yards on 19 carries including a short fourth-quarter touchdown run that helped seal the opening day victory. In the absence of wide receiver Jordy Nelson, Rodgers completed passes to five different players with an average of 10.5 yards a catch. Seattle is now just 1-3-1 against the spread in its last five games, but it is still a profitable 15-7 ATS over its last 22 games on the road. The Packers are 6-2 ATS in their last eight home games and the total has gone OVER in seven of their last nine games at home. Head-to-head in this matchup, Green Bay has a 4-2 edge ATS in the last six meetings. The revenge factor looms big in this game to the point where I would lay the 3.5 points and go with the Packers to cover on their home field.